By – Merriam-Webster’s 11th Collegiate Dictionary defines tot as “1: a small child: TODDLER; 2: a small drink or allowance of liquor: SHOT.” Torus Power used it to name their compact line of toroidal Power Transformers. Although small in size, weight, and price, the TOT AVR includes the Automatic Voltage Regulation referred to in its name, as well as noise filtering and smart Ethernet control, and is available with series-mode surge suppression (SMSS) circuit protection. Kevin Main, president of Torus Power, joined me for lunch in Las Vegas during the 2016 Consumer Electronics Show, to tell me the story of the TOT AVR. It began with a call from one of their Mexican sales representatives. Mexico City, where the nominal voltage is 127V, suffers from daily voltage variations, with swings from 85V to 145V that repeatably stress the amplifier sections of stereo receivers, which eventually fail. Simply preventing voltage spikes can’t protect electronics from wide variations in voltage that happen slowly, over minutes. 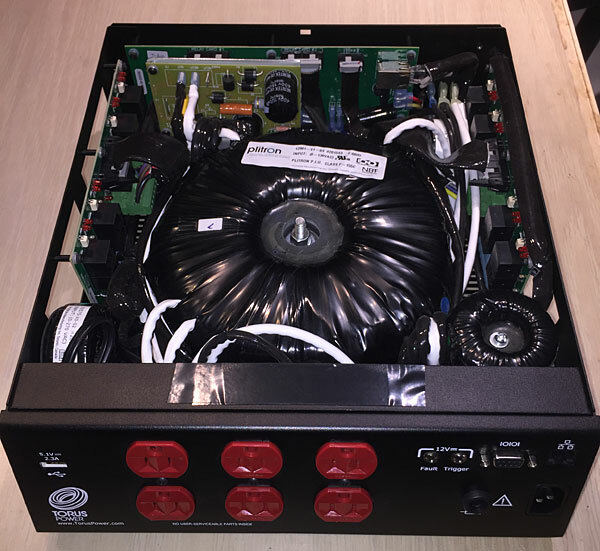 Torus Power’s AVR-15 power transformer ($3500) could stabilize the line voltage but proved too expensive, too big, and too heavy (56 lbs) to appeal to the owners of $1200 stereo receivers. Torus’s engineers adapted the AVR-15 into a lower-amperage design in a much smaller, lighter, and less expensive package that regulated voltage while also protecting against surges and spikes, and called it the TOT AVR ($2299). When it began shipping, in October 2016, customer response was strong, and Mexico City audiophiles were safe at last. At the end of this tale, Main offered me a review sample. I eagerly accepted. As the review progressed, I became aware of the TOT AVR’s considerable strengths—as well as its limits. The parent company of Torus Power is Plitron (footnote 1), a 30-year-old Toronto company that builds power-supply transformers for Bryston, Krell, Mark Levinson, and Pass Labs amplifiers. At the time, Bryston also marketed a line of Plitron freestanding Power Isolation Units (PIUs) under the brand name Torus Power that combined surge suppression with AC-line noise filtering to provide clean AC power and protection from voltage spikes. 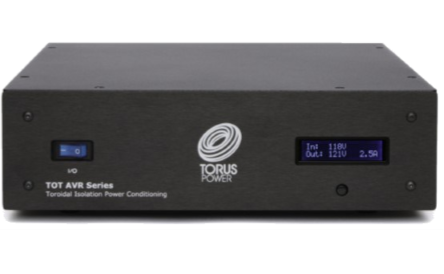 Torus Power now manufactures three TOTs: the six-outlet TOT Mini, with a maximum current input limit of 7A, a power rating of 805VA, and a weight of 25.5 lbs; the eight-outlet TOT Max (15A, 1725VA, 50 lbs); and the six-outlet TOT AVR (10A, 1200VA, 35.2 lbs). The TOT AVR is 48.9 lbs lighter, 6.5″ narrower, 2.5″ shallower, 2.3″ shorter, and $1300 cheaper than the Torus Power RM 20 I’ve used for the last eight years. Unlike the RM 20 and the two other TOTs, the TOT AVR can also regulate the AC line voltage so that it remains at 120V, ±5V. The TOT’s compact interior is dominated by an oversize, shock-mounted, 1200VA toroidal transformer attached by a pole piece to the bottom plate. This transformer is wrapped in Mylar tape, and has a Neoprene mount. It uses a triple-ground screen that functions as a low-pass filter to isolate the primary from the secondary windings in a way that is said to attenuate differential and common-mode, 2kHz–1MHz line noise from motors, lights, and dimmers. The TOT AVR’s startup delay function protects electronics plugged into it when power is restored following a blackout. The little remaining interior space is occupied by two smaller sensing transformers for the AVR stabilizer circuit, a board for other AVR components, and the optional SMSS board installed in my review sample ($250). The internal wiring is large-gauge and carefully dressed, with sturdy push-on connectors for easy servicing. Any open electrical contacts are shielded with additional insulation. All wiring and components look extremely rugged, and the large wire gauge, quality of connectors, and shielding all appear topnotch—as good as any I’ve seen in high-end power amplifiers. The TOT AVR’s Automatic Voltage Regulation (AVR) circuit is designed to maintain a stable voltage output of 120V, ±5V, within a range of 85–135V. As the line voltage changes, the AVR’s microprocessor-based system switches among nine different transformer taps to maintain the 120V output. (A 20-second delay is built into the AVR system.) If the incoming voltage goes above or below the 85–135V range (high or low), the TOT shuts itself down. Internal software allows the TOT AVR to access the Web via its Ethernet port, giving the user the ability to monitor and control its operation when away from home. The optional Series Mode Surge Suppression (SMSS) board provides rapid, reliable, repeatable protection from voltage surges; in TOT AVRs sold in the US, the SMSS circuit clamps the voltage instantly if it rises more than 2V above the 135V limit. This replaces the TOT’s standard metal-oxide varistors (MOVs), which Torus describes as “sacrificial” because they absorb the voltage surge by instantly dropping their resistance to zero, which they can handle for just a few cycles before being destroyed. Torus claims that the SMSS circuit provides reliable protection against voltage spikes of up to 6000V, current surges of up to 3000A, for up to 1000 repeated electrical events. This capability protects audiophile equipment not only from Mexico City’s overvoltage surges, but also from lightning strikes. The manual points out that the SMSS works only if the TOT AVR is left powered up, and warns that it is not designed to protect against any voltage irregularities that can occur during power blackouts and later restoration of power. The TOT AVR had been designed for products whose current draw would not exceed its 10A limit. My Mark Levinson No.334 stereo amplifier can draw 5–6 amps to drive my 4 ohm Revel loudspeakers—well within the TOT’s 10A limit. For example, the steady-state current draw of my No.334 amp never exceeded 9A (sustained) when playing the bass-heavy “Deeper Well,” from Emmylou Harris’s Spyboy (CD, Eminent 25001-2). On the other hand, each of my two JL Audio Fathom f212 v2 powered subwoofers contains an amplifier capable of short-term output of 3600W—three times the TOT’s spec of 1200VA. Brett Hanes, Home Audio Product Engineer for JLA, stated that the f212 v2 rarely exceeds peaks of 1000W with music, and thought the TOT AVR could handle the load. He proved to be correct. Even so, I kept a close eye on the TOT AVR’s display, to track the steady-state current draw. Installation involved placing the 35.2-lb TOT AVR atop the larger Torus RM-20, where it would get adequate ventilation. At different times, I plugged the cords of a variety of components into the TOT AVR’s rear-panel jacks, with its own detachable power cord plugged into the wall. The TOT AVR supplied power to my Mark Levinson No.334 dual-mono stereo amplifier (125Wpc into 8 ohms), a Mark Levinson No.585 integrated amplifier (200Wpc into 8 ohms), my two JLA Fathom subs, and JLA’s CR-1 electronic crossover (30W). Later, I plugged into it a pair of Mark Levinson No.536 monoblocks (400W into 8 ohms). With the TOT AVR feeding my reference system of a Mark Levinson No.334 stereo amplifier driving a pair of Revel Ultima Salon2 speakers, I heard subtle improvements in imaging, soundstage depth, and instrumental timbres, as well as in dynamic range, resolution, and tonal balance. The TOT created jet-“black” backgrounds that enhanced the three-dimensionality of images even when dynamics were extreme or the volume was loud. Removing the TOT AVR from my system made me aware of the slight line noise from my wall outlets. This was most evident when I listened to the prominent conga drum that opens “Hotel California,” from the Eagles’ Hell Freezes Over (CD, Geffen GEFD-24725). Without the line noise, the drumbeats at center stage that anchor this passage were more clearly defined and separate from the crowd noise. The similarly massive bass chord that cuts in just after the opening of Emmylou Harris’s “Deeper Well,” from Spyboy (CD, Eminent 25001-2), was focused front and center, allowing me to hear her voice and the drums separately, farther back on the stage. As I played music, the TOT AVR displayed the Mark Levinson No.334 amplifier’s current draw in real time. With no signal present and the amplifier idling, the current showed as 0.5A. The ML No.536 monoblocks raised the current draw at idle to 5A. “The Maker,” also from Spyboy, drew a continuous 6.4A from the No.334, and 11A from the ML No.536s. John Rutter’s Lord, Make Me an Instrument of Thy Peace pulled 2.6A, and his Piè Jesu drew 1.7A—both from Requiem, with Timothy Seelig conducting the Turtle Creek Chorale (CD, Reference RR-57CD)—and roughly twice those figures from the No.536s. The dense, solid bass-drum notes that erupt from Eiji Oue and the Minnesota Orchestra’s recording of Stravinsky’s The Rite of Spring (24-bit/176kHz PCM file, Reference RR-70) drew 7.5A from the No.334 and 12.6A from the No.536s. Incidentally, as I played this recording, the TOT AVR’s display reported a drop in the line voltage to 110V, even as it maintained an output voltage of 123V. I inadvertently confirmed the TOT AVR’s specified upper current limit of 1200W, 10A when I pushed the No.536s—each capable of drawing 1000W—even harder than I had before. During “Deeper Well,” the Torus’s display read 16A. The two No.536 monoblocks and Revel Ultima Salon2 speakers continued to show off their jaw-dropping dynamic range against noiseless backgrounds. But my joy was short-lived—the TOT AVR soon shut down. I removed the top plate, and while I saw no evidence of damage and there was no smell of burning parts, I couldn’t get the TOT AVR to turn back on. My digital multimeter confirmed that the TOT AVR’s 10A ceramic fuse had blown. A quick trip to Home Depot scored a new Eaton Bussmann fABC-10, a fast-acting, 10A ceramic fuse designed for use in microwave ovens. The TOT AVR instantly revived, no worse for wear. My eight-year-old, 10-outlet Torus Power RM 20 (current price $3299) uses the same filtering and toroidal-transformer isolation as the TOT AVR, and produces most of the same improvements in line-noise suppression, tonal balance, and resolution. On the other hand, the much smaller TOT AVR did a better job of improving the three-dimensionality of my system’s sound, and its reproduction of detail and palpability of imaging—but it did blow that fuse when supplying AC to my Levinson No.536 monoblocks. The RM 20 never broke a sweat. I compared the AVR TOT’s specs and price with those of other Power Transformers listed in ‘s “Recommended Components.” All sport the same important features: line-noise filtering, surge suppression, an isolation transformer, and the use of non-MOV circuits to provide protection from voltage spikes following lightning strokes. PS Audio’s Power Plant Premier AC Regenerator (36 lbs, 10 outlets, $2195) matched the TOT AVR’s 1200VA power rating, while PSA’s newer PerfectWave P10 Power Plant AC Regenerator (82 lbs, 10 outlets, $4999) can handle power up to 1500VA. 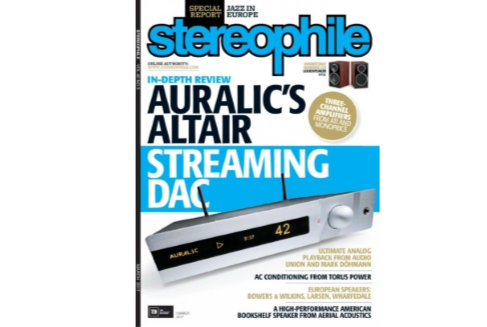 AudioQuest’s Niagara 7000 Low-Z Power Noise-Dissipation System (81 lbs, 2400VA, 12 outlets, $7995), which shares many of the TOT AVR’s features but can handle up to twice the power, was voted Stereophile‘s Joint Accessory of the Year for 2016. Audience LLC’s AdeptResponse aR12-TS (15 lbs, 2400VA, 12 outlets, $8995) includes non-MOV voltage-spike protection, line filtering, and power-factor correction. Setting aside the higher power-handling abilities and list prices of these recommended models, the TOT AVR provides most of their key operating features in a smaller, lighter, less expensive, lower-current package that also offers automatic voltage regulation. The more I lived with Torus Power’s TOT AVR, the more it delighted me. I enjoyed its modest size, moderate weight, and reasonable price, as well as the peace of mind of knowing that my gear was safe from lightning. Its build quality is first-rate, and its feature list is more practical than exotic. In my system, the TOT AVR improved musical detail and three-dimensional imaging for a wide range of music. And did I say that I like its low price? As with the Apple iPad, I couldn’t have imagined how much this little power transformer could become a necessary part of my audio system until I’d lived with it for nearly a year. The TOT AVR’s only limitation is its power capacity. When considering adding a power transformer—especially this one—to an audio system, the buyer should make sure its specs match the system’s requirements. This means that the TOT AVR should not be used in systems whose steady-state current demands exceed 10A. For such systems—eg, my own when my 400W monoblocks are in use—use a 2400W-rated power transformer such as AudioQuest’s Niagara 7000, Audience’s AdeptResponse aR12-TS, or Torus’s own RM 20. Otherwise, I highly recommend the TOT AVR.